What on earth is Rajalta Rajalle-hiihto I hear most of you asking. That is exactly what I was asking my friend too, when she suggested I google Rajalta Rajalle-hiihto 2013, and see if I fancied signing up for it with her. In English it is known as the Border to Border skiing event, or Rajalta Rajalle-hiihto in Finnish. 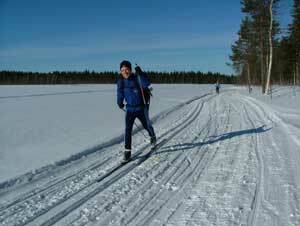 It is a 440km cross country skiing event that goes right across Lapland, from Kuusamo (near the Finnish border with Russia) to Tornio (on the Finnish border with Sweden). There are 7 skiing days in total, with each day ranging from 44 up to 78km. Up to four groups can take part in the event, and each group can contain a maximum of 100 skiers. The first group leaves on the 7th March, the second group on the 8th March, the third group on the 9th March and the final group on the 10th March. People of all ages and nationalities take part in the event, but it is a fun activity as opposed to a competition. It used to be known as the world's longest organised ski tour, until the Finns went and created an even longer 6 week event that traverses the length of the country. Each day a single piste is cut into the snow. The piste is designed for classic cross country skiing as opposed to skating style, but from time to time people have been known to cheat and start skating some sections of it. I am now signed up for the RR1 group, which departs from Kuusamo on the 7th March. It is going to be an awful lot of fun and another story to tell my grandchildren one day. I will obviously have to maintain a high level of fitness from now until March, but other than that the main issue I have been told I will face is blister management. That reminds me of another little event that I took part in recently called the mighty Marathon des Sables. In addition to the Border to Border event I also signed myself up for the Ticino half marathon today. It takes place on November 11th, and Anny will be running it too. Not only that but one of my colleagues has already signed up for it, and another two are considering it. I ran the Ticino half marathon back in 2008 and completed it in 1 hour 40 minutes and 39 seconds. This time I shall be hoping for a good 10 minutes quicker than that, if not more. We shall have to see if I manage it. The time that I get in the Ticino half marathon will be a good indicator of what time I can expect to do in the Pisa marathon in December. If I cannot do the Ticino half marathon in under 1 hour 30 minutes then I can be almost guaranteed I will not manage to pull off a sub 3 marathon in December. Even as it is a sub 3 by December looks to be pushing it. If it does not come this year then I will have to attempt it again next year, possibly in the Zurich marathon in April.